Macular degeneration is the leading cause of vision loss, affecting more than 10 million Americans. If you’re experiencing vision problems due to macular degeneration, Dr. Dip Jadav can help. He offers effective macular degeneration treatment to prevent permanent vision loss in people in and around Sugar Land, Texas, at Outlook Eye & Laser Center. To learn more about the risks of macular degeneration, schedule a consultation online or by phone. Macular degeneration is the result of the deterioration of your retina, the part of your eye responsible for recording what we see and sending those images to the brain via the optic nerve. The central part of the retina, known as the macula, helps focus the central vision in your eye and makes it possible for us to drive a car, recognize people, and see the fine details in objects. Over time, as the macula begins to deteriorate, your vision gets progressively worse. You may be at increased risk for developing macular degeneration if you’re Caucasian and female. There are two kinds of macular degeneration, wet and dry. In wet macular degeneration, the early symptom is seeing straight lines as wavy. The wet version is less common than dry but can be more aggressive in vision loss. In the early stages of dry macular degeneration, you may experience blurred vision and an inability to recognize faces until they’re very close to you. Advanced dry degeneration may cause a blurred spot in your central vision. 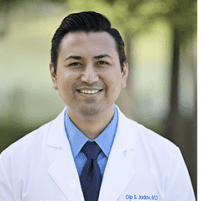 There is no treatment for dry macular degeneration, but Dr. Jadav can slow the progression of the condition through lifestyle changes and other treatments. What treatment options are available for macular degeneration? While the dry type can’t be cured, Dr. Jadav can treat the wet type of macular degeneration using advanced laser therapy. The laser destroys the leaky blood vessels that are causing the degeneration so you won’t lose any more of your vision. Dr. Jadav can also recommend injections with prescription medications that stop the growth of new blood vessels. This injection goes into the fluid of your eye, and you may need monthly treatments to maintain results. To learn more about macular degeneration, schedule an appointment online or by phone.